I like to eat seafood pasta without all that sauce covering up the seafood sometime...Just that fresh seafood favor to enjoy without the covers. Great meal on Friday night with a great glass of wine. Place the pasta into boiling water and cook until al dente and set a side for later. Place the butter into a pan on medium heat. Allow the butter to melt. Add the seasoning. stir together with the melted butter. Add the chicken and fresh scallops into the pan and continue to cook until the chicken and scallops are done by tossing them.take chicken and scallops out of the pan and set a side. Add shrimp and cook until done (not over cook ) set aside. in same pan add peppers,onions and garlic and sauté until desire tenderness. pour in the clam juice adding all the cooked ingredients cook thoroughly for 2 mins adding tomatoes. 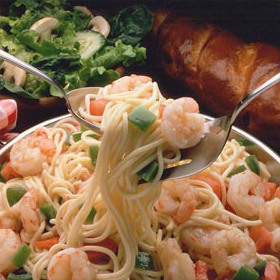 Place desired serving of pasta on a plate and add seafood.